Last weekend was my birthday. 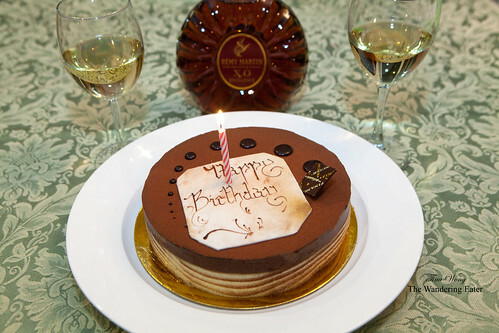 I celebrated initially with a group of friends and family by sharing the Marechal Praline cake that is currently part of Financier’s holiday cakes with some celebratory booze (sweet white port and Rémy Martin XO Cognac). I chose this cake since it would appeal to a lot of my guests. 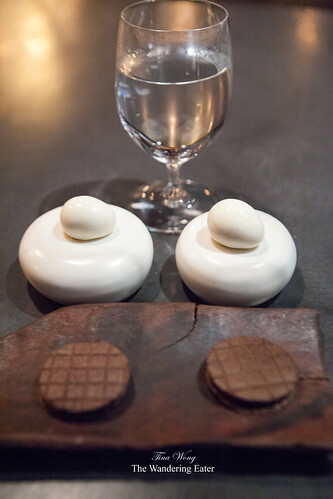 It’s a moist, chocolate praline mousse and they liked the delicately crisp feuillatine texture found in the mousse. Many thanks for Financier for delivering the beautiful and delicious cake to my home! Right after the cake, a good friend of mine and I set out to Atera in Tribeca. 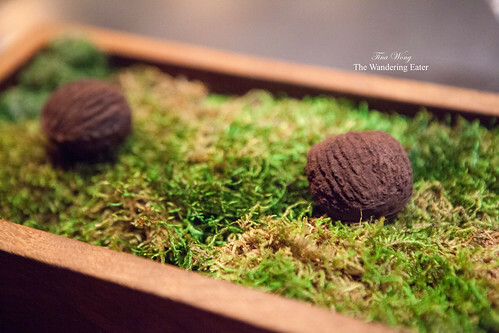 I’ve been curious about Atera (a recent 2* Michelin (2014) awarded restaurant) for quite sometime now and thought it’s about time I should dine there. This restaurant has generated some fuss from diners (mostly those who have not dined there) as of recent months because of the changes of getting reservations. 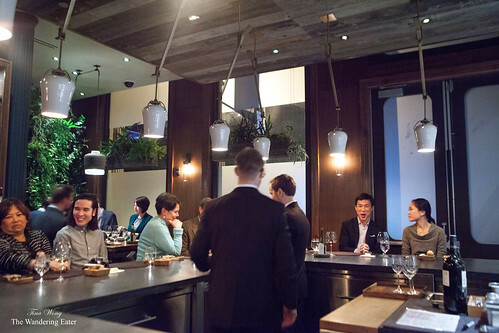 If you do choose to dine there, there are a choice of two or three time slots every Tuesday to Saturday and the restaurant charges ahead of time ($195 per person, plus tax ($17.31) and a 20% service charge ($39)) for 20 or so courses (or as the restaurant calls them snacks). Yes, you will be paying a little more than $500 for two people but I think it’s worth it. 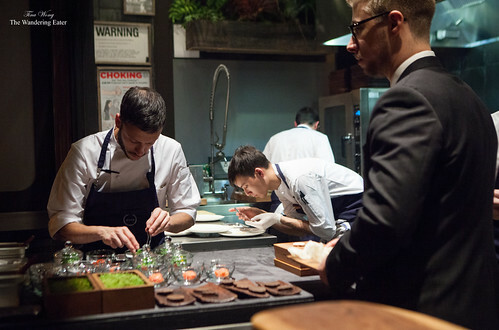 It’s a very unique meal that is different from other restaurants in New York City. Chef Matthew Lightner (who is from Portland, OR) and his crew cooks a different kind of Modernist cuisine that is unlike Corton under the helm of Chef Paul Liebrandt (it closed this summer but I had an excellent dinner two years ago that is deeply set in French cuisine) or Wylie Dufresne of wd-50 (modern American but with a quirky sense of humor). 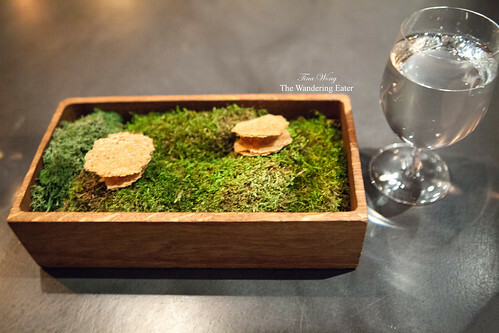 Lightner’s food is sophisticated (and he forages his ingredients) and as the servers tell you toward dessert, it’s reflective of his memories while growing up as well as using techniques he learned while working at the world famous restaurant Noma (owned by chef René Redzepi in Copenhagen, Denmark). When we arrived at Atera, we’re slightly confused by the lack of an exterior sign at 77 Worth Street to indicate we are at the right place (at the tall, narrow window next to the door is just a long listing of shops and studios who share the lot) but we entered the door and was warmly greeted by a hostess and checked us off with her iPad for our reservation and ever since, the front of the house has said “Happy birthday” to me prior to and after the meal. It’s a good thing. This intimate dining room shares the space with the open kitchen. It seats about fourteen people around the U-shaped kitchen counter with a small communal table that could fit a party of six in the back. It’s a handsome, dark wooded dining room with delicate vines and LED lights strewn around the walls to make it feel like a forest. 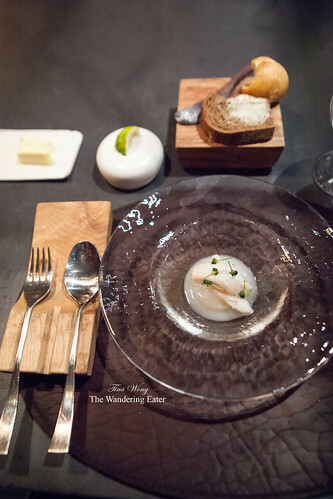 What I find it unusual is the fact Atera serves a series of “snacks” as a prelude or amuse bouches to what they would consider as the actual meal. 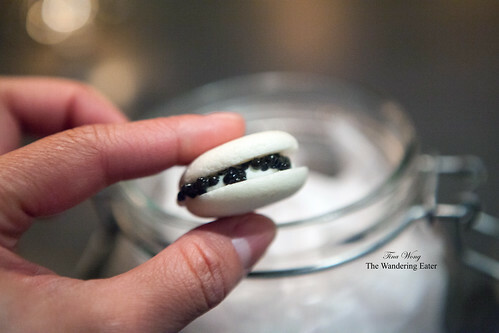 We started with root beer macarons with caviar. These are macarons in the sense of it being a meringue sandwiching a savory crème fraîche based, root beer filling that the luxurious and briny caviar. (Don’t worry, it’s not the sweet macaron cookie.) 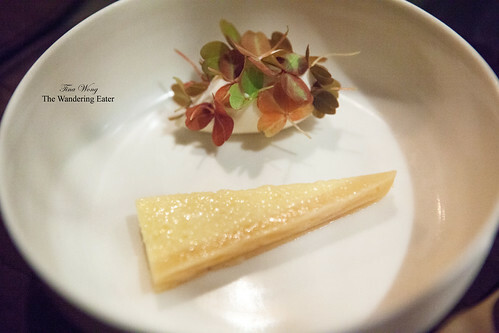 Quickly came in slices of ruby pink beets dipped in beeswax that was earthy sweet and silky textured from the beeswax. 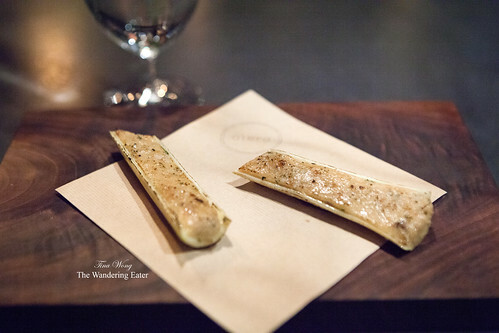 The silky geoduck that has crisp textures from the oyster cracker, “air baguette” and ethereal smokiness from the pork fat brushed was quite phenomenal. 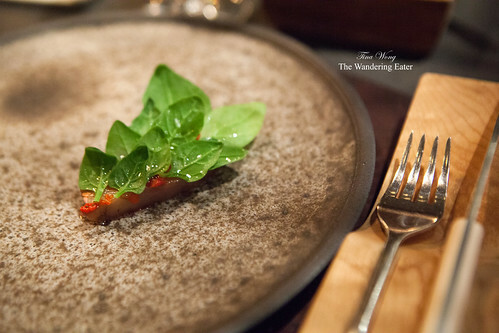 The sandwich of trout roe in between delicately nutty amaranth toasts were umami bombs of sweet and salinity. The lobster roll didn’t look like the typical lobster roll but it’s certainly tasted like one. 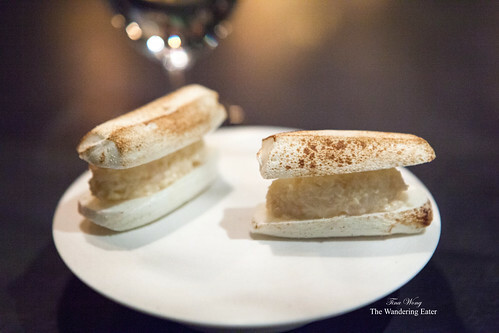 The main difference was the “bread” portion of Atera’s rolls were yeast-flavored meringues. The delicate crispness and airiness of the meringues made me concentrate on the intensely sweet, creamy lobster filling while providing the texture my palate craved. The last three “snacks” had a lot of complexity and when I had my head scratching moments of “how do they make this?” curiosity that my dining companion couldn’t help but laugh at me. 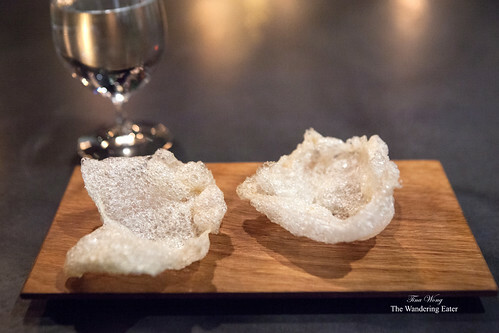 The beef tendon chip brushed with housemade uni (sea urchin) fish sauce vaguely reminded me of the shrimp chips I had while I was growing up except this is obviously on a different level. I wished I had a small bag full of them. 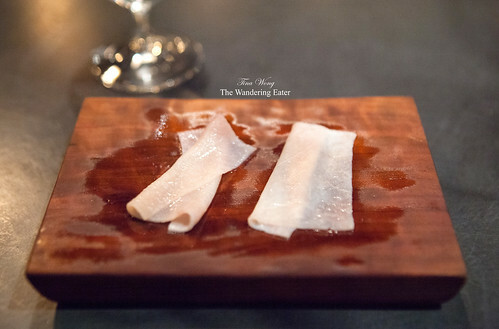 The pig’s blood wafers and pickled quail egg were served at the same time. The pig’s blood wafers were incredible. 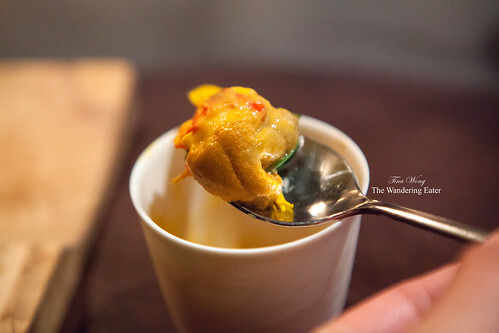 I found out the delectable, creamy pickled quail egg was literally too good to be true. It is a trick egg, made of aïoli bound in a milk skin. The bone marrow was entirely edible. We looked quizzically at our server and he just smiled at us. We pickled up our “marrows” and found them to be fairly soft. The bone portion was made of hearts of palm. The snappy half-pipes cradle their creamy innards. The flavor had profound depth from a bit of grill char and hit of umami pairing of unctuous marrow with luxurious béchamel. It feels balanced rather than weighted down by too many rich ingredients. The swordfish drenched in pork belly was a deceptively simple sliver of silky swordfish to start off what is considered our actual meal. 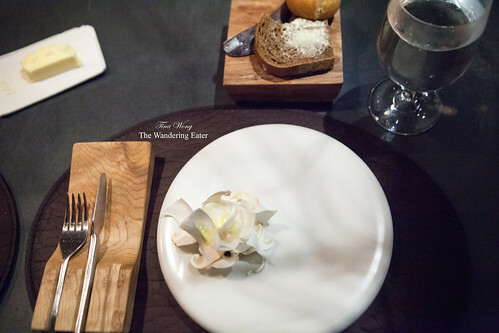 Their official first course of olives and grapes topped with Bachelor Button flowers seemed like a play of words but it’s literally what it is. Juicy, sweet round black orbs of Jupiter grapes piled on top of a swathe of salty black olive purée‎. Unusual pairing of flavors but it mostly worked. 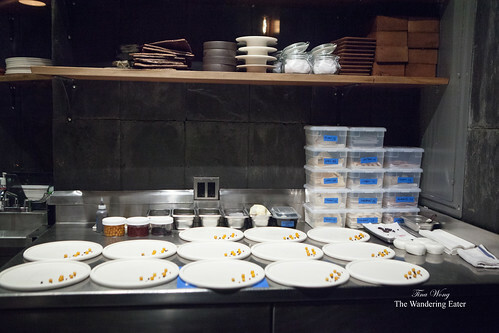 This particular dish was the most tweeted/Instagrammed/photographed of the evening. 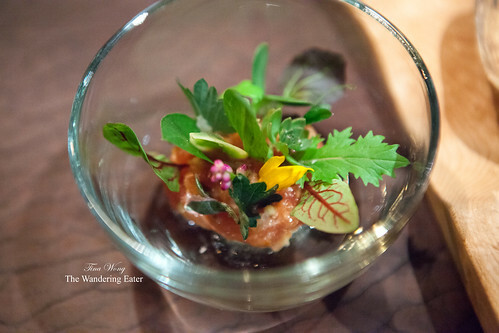 The yellowfin tuna, tomato preserves and sunflower was beautiful and there was a particular smoke (I don’t recall now) pumped into the glass vessel prior to placing the lid to this bowl. 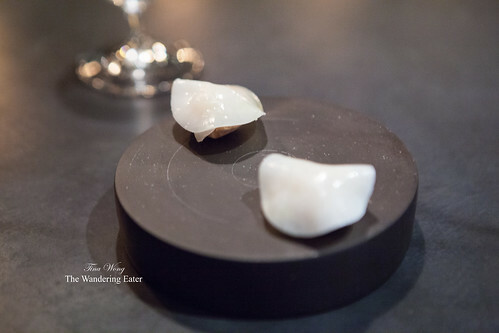 The meticulously tweezed beige petals of razor clam, garlic, and almond were crunchy, slightly briny bites. 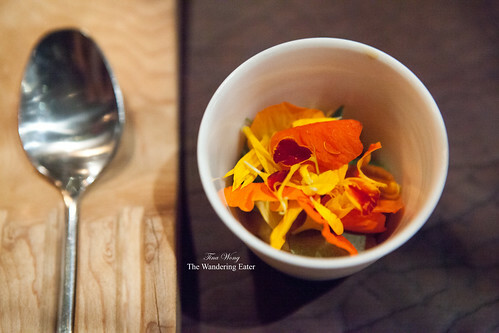 Unlike its previous monochrome plate, this was a technicolor bowl of sea urchin, squash, and nasturtium. Spoonfuls of luscious, sweet uni (sea urchin) tongue mingled with the vegetally sweet squash purée, bitter, crunchy bites of greens and various orange nasturtiums all combined to complex bites. 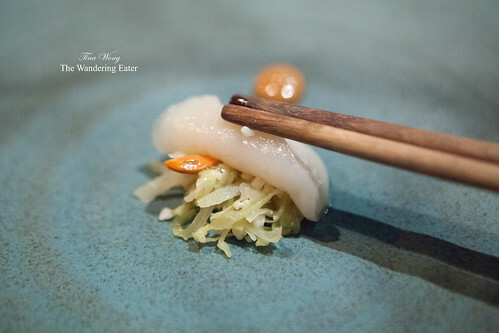 Barely warmed diver scallop, fermented cabbage, hazelnut was the only dish that was served with chopsticks. 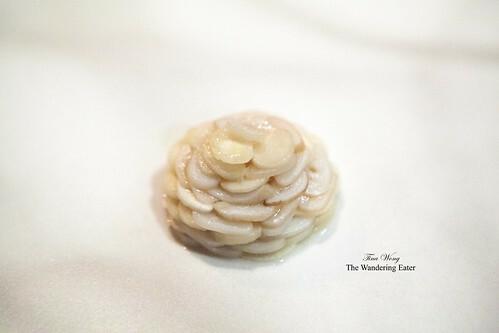 This bite was essentially subtle in flavors save for the salty end note and the silky scallop contrasted the crunchy cabbage very well. 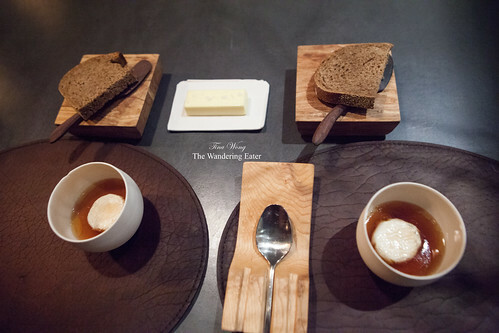 Bread service arrived and we were served a housemade bar of salted, fermented yogurt butter and a slice of sourdough wheat bread that was warm and had a nice slightly dense texture. Along with it was the peekytoe crab ravioli served with toasted grain dashi. 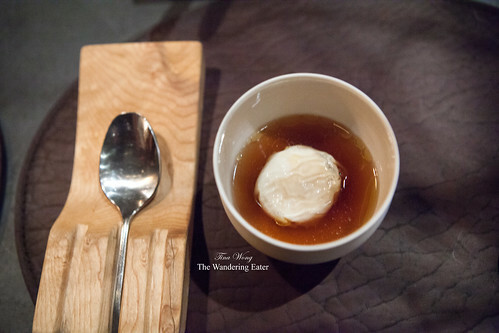 This particular ravioli’s wrapper was made of yuba to wrap this sweet fluffy packed puck of crab meat and the nutty, sweet, clean dashi was a perfect compliment to ravioli. 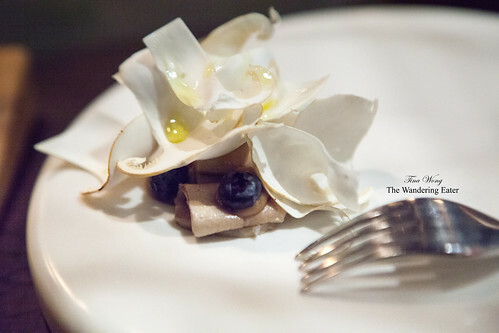 The Matsukate mushrooms, foie gras, pine nut, blueberry dish was perfectly balanced. It looked like a simple mound of fluffy curls of earthy mushrooms drizzled with a touch of olive oil but underneath that was a large ribbon of creamy foie gras with pickled blueberries and a sprinkling of crisp pine nuts. 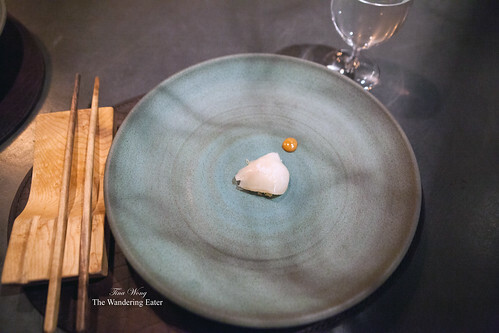 We swung back to crustacean and had a King crab with salt baked daikon turnip served with a wedge of fresh yuzu to squeeze more or less accordingly to how acidic you like this dish. 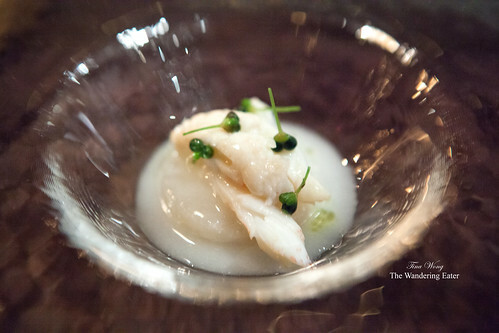 The yuzu added a complex sweet-acidic layer of flavor to the sweet crab and tender soft, lightly salted, bitter daikon. 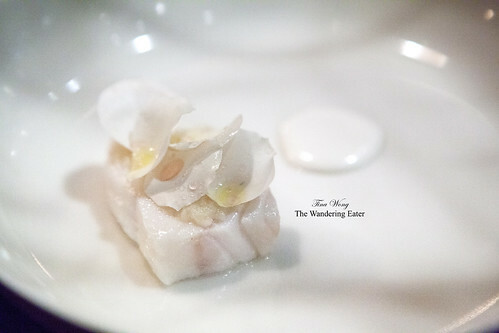 This stunning beauty of poached halibut, chamomile with Arctic rose was also very tasty. The delicate halibut carried out the subtle floral flavors of rose and chamomile. 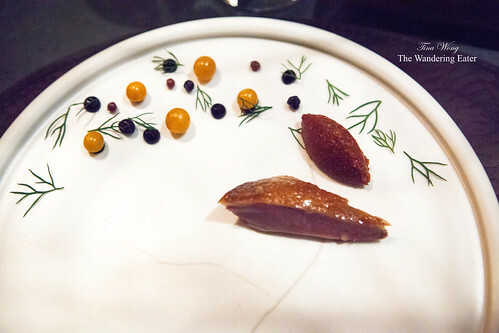 The roasted squab breast, berries, black garlic with bronze fennel looked like an artful scattering of ingredients. 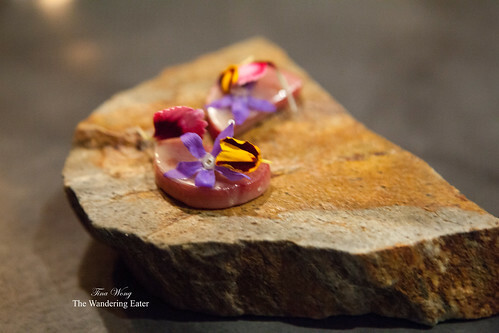 Pearls of sweet sungold tomatoes, anise-y fennel fronds, tart-sweet berries, quenelle of squab offal ragu and tender squab breast that create a cohesive, intense bites that leave me wanting more. The lamb rack, red pepper condiment with New Zealand spinach probably took the longest time to plate as I recalled seeing the small brigade of chefs coming together to get the twee individual spinach leaves carefully tweezed to the correct pattern. At any rate, this Elysian Fields roasted lamb was sublime. 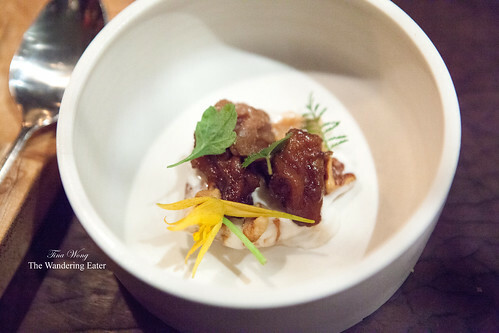 Tender, bold flavors that was a great ending to their savory courses. Pre-dessert was Parmesan cheesecake with wood sorrel sorbet. This cheesecake was quite literal as it’s not custard-y as a cheesecake we are familiar with. It’s almost as dense and funky as Parmesan cheese but sweeter with a salt edge. The sorbet had a wonderful woodsy flavor that managed to make sense on my palate despite sounding odd. 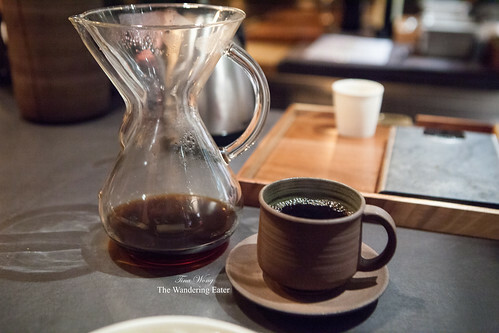 I wanted to have coffee with dessert, so their coffee service was done via Chemex with Cafe Grumpy‘s Santa Teresa, Guatemala beans. 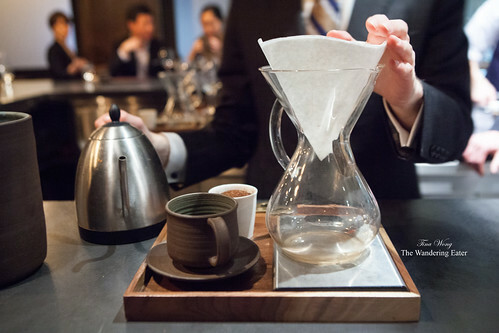 The young man who made our pot of coffee did a great job brewing it. Wonderfully bold, sweet, fruity with hints of orange. 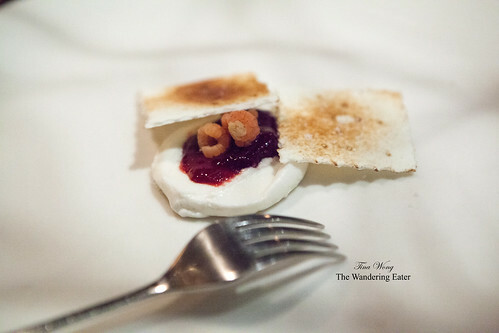 The first dessert out was saltine meringue crackers with raspberry and kiwi. We were told that this dessert was based on Chef Lightner’s childhood memory of eating saltine crackers, peanut butter and jelly as dessert. The meringue crackers did taste like saltines and the creamy and sweet spread were fun and did pervade this nostalgic moment while I was eating it. 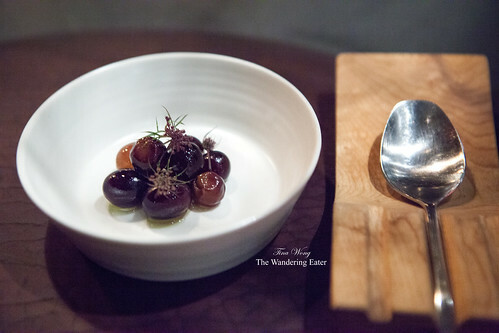 The walnut sundae, celery root and lemon balm was interestingly a meaty dessert. What I meant by meaty is the fact that it’s a chewy sundae. I had rich, creamy sundaes with bits of nuts or colorful sprinkles to give me texture but this sundae was chewy by having a very soft walnut that managed to look normal. My friend and I looked at each other wondering how?. Nevertheless, we’re blown how awesome this sundae was. 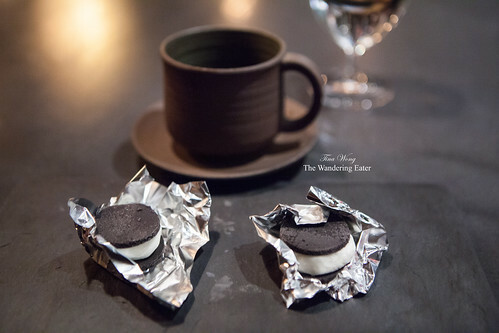 Just in case we didn’t have enough frozen desserts, we’re presented with adorable little bourbon cask ice cream sandwiches that has a slightly oak-y flavor infused. It’s oddly refreshing without feeling too weighed down whenever I associate or eat ice cream sandwiches. Also, there were petit fours of chocolate walnuts and chocolate pretzel. 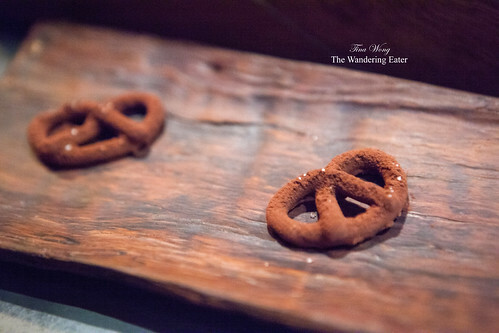 The chocolate walnut is a chocolate shell dusted in cocoa powder but has a candied walnut meat center (think marron glacé kind of texture) and the chocolate pretzel is a chocolate ganache shaped like a pretzel coated in a cocoa and pulverized pretzel powder. This meal was very inventive and open my eyes to flavor combinations I never thought would go together and left me curious how some of those dishes were made. Service was impeccable. I would consider to come back again on a non-birthday dinner sometime soon and the restaurant does deserve its 2* Michelin rating.